Amazon pulled off the most amazing stunt when they announced the Kindle Oasis last month. They convinced the tech blogosphere that an ereader with no unique features beyond an awkwardly-conceived, mandatory case was the best ereader ever. I, on the other hand, am underwhelmed. I got a Kindle Oasis review unit from Kindle PR on Friday, two days after it shipped to the public. Within a few hours I came to the opinion that the Oasis is not worth $290, nor is it the best ereader ever. It's not even the best Kindle ever. It is simply the latest Kindle, and currently the most expensive Kindle. The Kindle Oasis features a one-handed design which places the page turn buttons on one side of the screen. While it may have copied the button idea from earlier ereaders like the Pocketbook Inkpad, Kindle DX, and Pocketbook 360, the Oasis improves on the idea by also putting all of the electronics, and the Oasis' battery, behind the page turn buttons. This has the neat effect of putting most of the weight in the palm of your hand, rather than spread across the footprint of the Oasis, but it also has a downside. Since Amazon also chose to make this the thinnest Kindle ever, that left little room for a battery. Amazon has had to put most of the battery in the case, which connects to the Oasis via a 5-pin port. With the case removed, Amazon's wildly unrealistic specs claim that the Kindle has about 7 hours of battery life. Attach the case and the battery is supposed to last for months. Or at least that's what Amazon's marketing materials say; real life experience disagrees. I didn't test the Oasis without the cover, but I have found that with the case attached the Oasis has around 3 real days of battery life. I found that with my typical reading habits, I had to recharge it at least twice a week. In comparison, my 10" Android tablet usually lasts for a week or more of reading and light web browsing. I use this tablet as my excuse to not get up early, and instead stay in bed and triage my email and read ebooks. It's slow, but it works well enough that I can get work done. But in the Oasis' defense, the tablet is huge and awkward and the Oasis has a sleek and pleasant one-handed design. Surely it has a better reading experience? I know that many reviewers are gushing about holding the Oasis in one hand, but I haven't found the reading experience to be any better than on my second-gen Kindle Paperwhite. Yes, I like reading on the Oasis, but there's nothing that really grabs me and makes me want to continue reading on it. In fact, I have been neglecting the Oasis for the past few days, and instead have been reading on my Paperwhite. While I was testing the Voiceview features, I was reminded of an ebook I wanted to reread. It was on my Paperwhite, so for the past few days I have been picking it up and reading on it. I know, I know, I really should have copied the ebook over to the Oasis, but I just wanted to read the ebook. And since both the Oasis and Paperwhite have essentially the same software, I couldn't really see what I was missing out on (aside from the physical differences). Frankly, after having used the Oasis for a couple weeks, I feel that this is the Paperwhite Lite. It's the smallest of the Kindle ereaders, which is why it gives the subconscious impression that it should also be the cheapest. Instead it costs three times as much, and does nothing to convince me that it's worth the price. It has a leather case, yes, but I don't care much about cases - not even when I am forced to use one just to get average battery life. It is thin, yes, but that has no practical value to me - and it comes at the cost of battery life. It has page turn buttons, yes, but so do a lot of other ereaders. So no, I don't like this ereader. But do you know what would change my mind? I'd like to see a Kindle with a 6.8" screen, or an 8" screen. Now that would be a Kindle which was _more_ than a Paperwhite rather than less. That would be worth paying a premium price. As it stands, I think the Paperwhite is the better value, or the Voyage. They have the same software features, and cost a lot less than the Oasis. And if you want a recommendation for a premium ereader, I would suggest the Kobo Aura H2O. It has the bigger screen, more formatting options than you can shake a stick at, and it still manages to cost less than the Kindle Oasis. Or if you can get your hands on one, try the Pocketbook InkPad. With its 8" screen and one-handed design, the InkPad is what the Oasis could have and should have been. The InkPad is the hardback reading experience to the Kindle's paperback reading experience, and it was worth the cost. The Oasis, not so much. 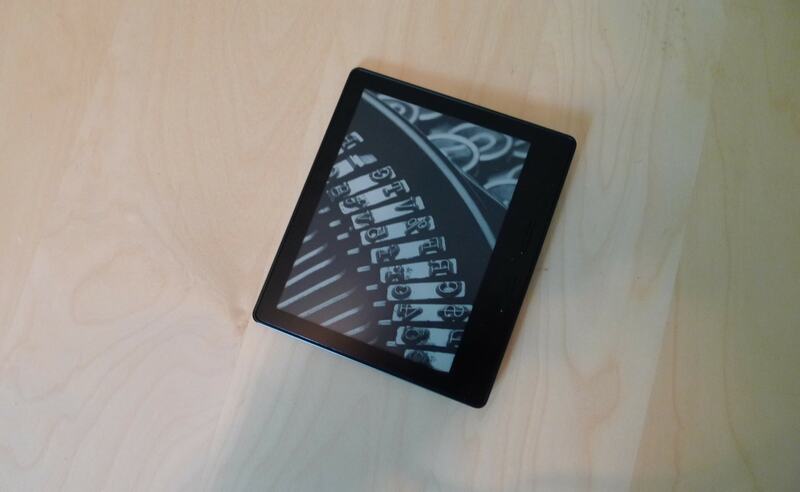 The 8″ Inkpad is going on Amazon.co.uk for 167 GBP. Pretty good value. If it ran Android, I’d be tempted. The Oasis is going for 329 GBP. With e_ink unable to make strides in their screen tech, Amazon is left with device dressing. The problem is, they haven’t done enough to justify that price. Bigger screen, built in audio for tts, Bluetooth. I don’t I stand this rush to make things so thin they become useless because of the battery. I’m still on first gen PW. I compared them all at the store..maybe I would consider voyage but I’m still waiting on something that makes this a must have for the money. Amazon is the new Apple. In retrospect, yes. Jason Perlow was right. I actually really like my Oasis. However I would agree on preferring a larger screen. Oasis is almost perfect except from its price. Larger screen is unnecessery I think unless if one intend to read an PDF. The Oasis is definitely my e-reader of choice. Given the nature of the books I read there is no realistic alternative to Kindle format for most of them, which makes non-Kindle readers awkward, and I value the page-turn buttons a great deal. I’ve been getting better battery life than I ever have with a PW or Voyage. To clarify for readers: to recharge the reader you have only to put it back in its case. It draws from the case’s big battery to recharge itself. To each his own e-reader. There really is no difference between Kindle format and epub. What type of books do you read? Alot of indie or self-published only on the amazon platform? That’s the only thing I could think of. I find it amusing how people think that the buttons are a big selling point. Literally just two years ago you could buy a $60 kindle with page turn buttons. Now you could probably find ’em for $20-30 used or even refurbished. I guess I don’t drink the kool aid, because I would never praise a company for phasing out cheap technology only to reintroduce it later at 5x the price. Most of the books I read are serious/academic nonfiction that’s published only in Kindle form. I have a Kindle Keyboard whose buttons worked very well for me, but whose screen no longer does. I read a lot and my eyesight is not great; I need the better screen. Actually the buttons on the Oasis are a bit better. That is very strange. Academic journals don’t use the kindle platform, at least not what the ones I know. Textbooks use a completely different platform, and me and everyone I know still prefers print for textbooks. Don’t take my word for it. Look at the lists for the major academic publishers. I also really, really like my Oasis. I think it is far better than the Voyage which I did not like. With the Voyage the “New” features were the haptic page turn buttons and the adaptive light – neither of which worked properly. The PW3 is a very nice device – Amazon’s best PW to date. But the Oasis is wonderful for someone who reads constantly. I think everything about it – the page turn buttons, the rotation of the page when you switch hands and the fact that you can remove the cover for a really light weight feel plus the extra battery life are big step ups from the PW and well worth the price increase. Amazon are not interested in a larger screen because it only makes sense for larger format documents like PDF, and Amazon doesn’t control that format, so stands to make less money. A larger screen will be of interest to people interested in using a format not controlled by the Amazon ecosystem. So, no big screen for you, 10 year! What I really think is funny is that the Oasis lacks features that the cheaper Voyage has (i.e. the light sensor)!! I really think that this device was invented to boost sales on the Voyage and not to be successful by itself. I’m glad to see you recommend the Aura H20. It is the superior reader at a lower cost (due to larger screen and waterproofing). You don’t have to be invested in the Kobo ecosystem. It will read any epubs and mobi, and I personally have my ebook collection DRM free in my dropbox account. It’s too bad that the Pocketbook InkPad is so hard to buy. Maybe Kobo will launch an 8 inch reader, I think there is an audience for it provided that the price point is not too high and the reader is not too heavy. Still, they could have included TTS as base functionality, or thrown in the adapter for free. But then the whole point of the Oasis is a premium price for those Amazon can get to pay for it. They had TTS on the Kindle 3. They got rid of it and audio entirely to save money. That was my first kindle, and I guess it’s nostalgia speaking but I think there was a purity in form and function to that ereader. There was no touch screen, no light, no ads. Just a good screen and huge honking page turn buttons. The only thing I don’t miss is that silly keyboard. I think when I visit my folks, I’ll dig it out and use it some more. This asymmetric weigh distribution is reminiscent of the Lenovo Yoga tablet but done half-heartedly. The Yoga, now that’s a “pleasant one-handed design” and it looks good, too. All the nits people pick to rationalize their opposition to the Oasis remind me a great deal of the nits others pick to rationalize their opposition to e-books. My nit would be the price. No way would I bother with that kind of price when there are so many other readers out there with more functions and a better price. I do like the turn buttons and still have my kindle keyboard with the turn buttons. I don’t want a touch screen. I do like the keyboard even though I don’t use it often. If I were to buy another e-reader today, I’d consider the Kobo H2O or a paperwhite. The oasis wouldn’t even be in the maybe box. Or maybe they just think it’s lots of money for old rope. The point of the Oasis it is a desirable object rather than just a functional reading device. This is the thing that gets a customer to take a took at it, even if the customer decides to get a cheaper model. Companies do this all the time.